Skills and abilities: As the child of two master thieves she was presumably trained in the art of infiltration, stealth, lock picking etc. 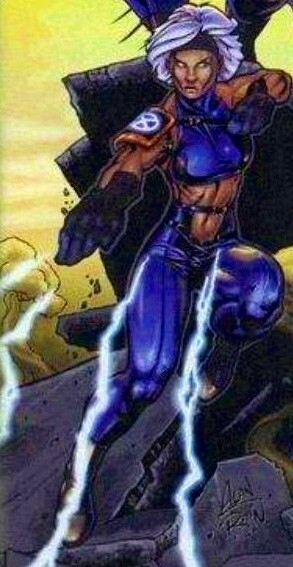 Powers: Medea’s power is that of rapid-fire chain lightning in a manner similar to her father’s energy blast ability. In the year 2035 most of the X-men are dead and the children of the X-men now lead by Wolverine and an elder Kitty Pryde. Her world is one of cinder and ash where the thieves Gambit and Storm fell in love. Teammates in her timeline are Gull (daughter of Archangel), Salamander (son of Nightcrawler), Metallique (daughter of Colossus), Wolverine, and Lockheed (large and in charge). Their mission is to defeat the Morlocks of their time who have decided to finally surface and ravage the planet.